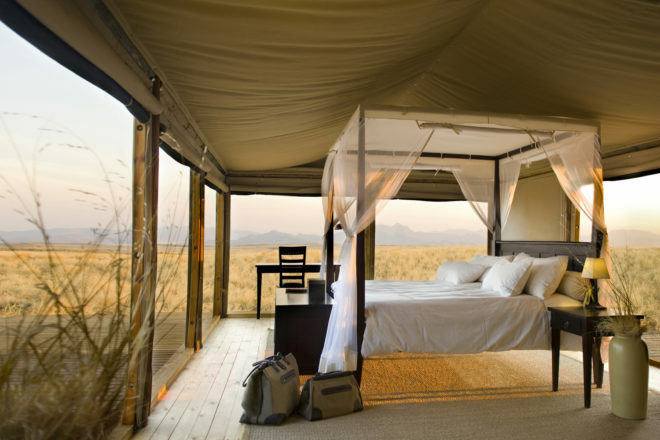 Dunes Lodge in NambiRand Nature Reserve, Namibia. In the vast, pristine sand dunes of the Namibrand Nature Reserve of Namibia, the quiet natural, secluded surroundings of Dunes Lodge overwhelms travellers. The vast desert landscape, as seen from the four poster bed, is a luxurious escape in one of the most beautiful yet harsh surrounds. The Dunes Lodge’s stylish wooden structures and canvas blinds open up to the peaceful desert backdrop – allowing you to sleep under the stars in lavish comfort. Each of the nine chalets have a private balcony and access to the unspoiled sand dunes. Guests eat and relax in the impressive and elegant communal lounge area and pool. For romantic couples the lodge has secluded dinners, while family groups can enjoy a communal meal in the lodge house. The eating is they like ‘bushman style’ – caveman style. All of the food is, of course, fit for royalty, or Brangelina and Charlize Theron who are past guests. Days are spent lazily enjoying the quiet sounds whilst watching the copious local game, if you’re lucky you could spot a leopard. Or if you felt like being more active, local guided walks and hiking trips are available, as well as full-day safaris, hot air ballooning and scenic flights. The lodge is part of the Wolwedans collection of refined lodges and camps. Each is set in a different glorious Namibian landscape; dunes and sandy plains, rocky mountains and gravel and sand plains.